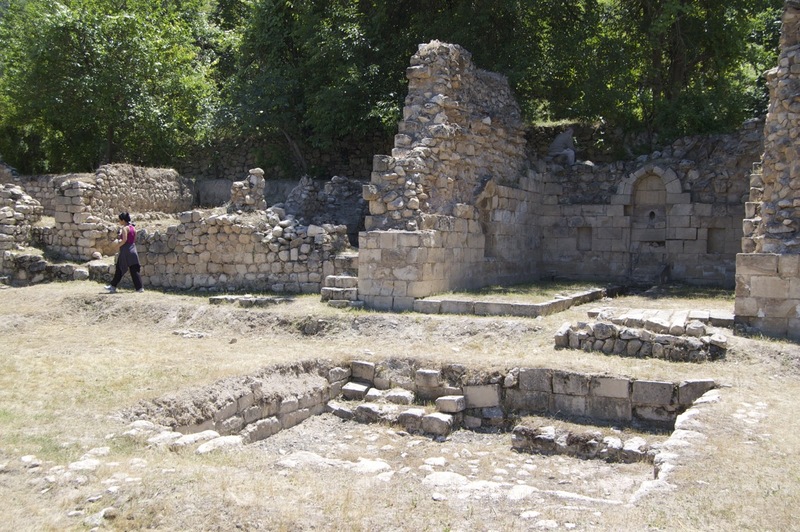 The Sâlihiyya Gardens are located to the east of the medieval ceramic kilns and the walls of Hasankeyf’s lower city. Here you will find fragments of villas, mosques and madrasahs among small garden plots where local Hasankeyf residents still cultivate fruits and vegetables. products of Hasankeyf's several gardens. In its location and distinctly “suburban” atmosphere, the Sâlihiyya district of Hasankeyf recalls the City of the Dead in Cairo (where the wealthy retreated to family mausoleums for holidays and in summer), the Salahiyya district of tombs and dervish lodges on the edge of Damascus, and the cemeteries and gardens on either side of the defense walls of Istanbul. Whereas modern urban sprawl has engulfed and dwarfed the old fields and gardens in most cities of the region, in Hasankeyf the proportions of the Sâlihiyya district, lower city and citadel are much closer to what they would have been 900 years ago, when the Sokmen branch of the Artukids made its capital here. better-preserved sites in the Sâlihiyya Gardens. Ibn al-Munshi’, who wrote a historical chronicle of Hasankeyf in the early 15th century, writes that Sultan al-Malik al-Adil spent the summer of 1348 at the “Sâlihiyya Pavilion,” where he “enjoyed the pleasures of youth,” sitting most mornings “at the eyvan with his deputies and commanders attending to the affairs of the people and the business of government” and “summoning court entertainers” and his princely guests in the afternoons. district of Hasankeyf (east of the Sâlihiya Gardens). The sultan’s guests would likely have gathered in various chambers of the pavilion or in the courtyard, those of the highest status taking in the scene from the shade of eyvan. Following Artukid tradition, the innermost wall of the eyvan would have been ornamented with a fountain from which water emptied into a shallow channel in the floor of the eyvan, cooling the air as it flowed to the pool in the courtyard. example of the eyvan and pool combination. Garden districts were an integral part of medieval cities in Seljuk lands and across the Islamic world. The gardens of Merum, which stood outside the city walls of Konya, were “famed in Seljuk and Ottoman times for their lushness and beauty.”* Unfortunately, most of these gardens have disappeared, and scholars must rely on textual sources – poetry, epic, travel narrative and scientific treatises – to understand garden complexes as an alternative space for conducting business and entertaining guests. Further archaeological excavation at the Sâlihiyya Gardens has the potential to strengthen significantly scholarship on the history of medieval landscape design and the social uses of gardens. #HasankeyftoUNESCO. is always generous in sharing his expertise. * Scott Redford, Landscape and the State in Medieval Anatolia: Seljuk Gardens and Pavilions of Alanya, Turkey. Oxford: Archaeopress, 2000, p. 62.